The Uganda chapter of the IITA Youth Agripreneurs (IYA) program that seeks to attract educated young people to agribusiness was officially launched on Wednesday 24 June 2015 in Mukono District. farming activities they are already engaged in. 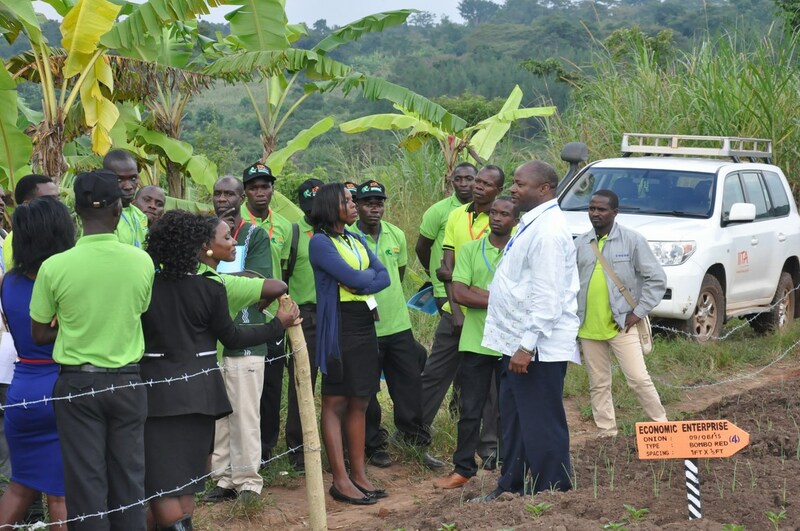 The Uganda Youth Agripreneurs (UYA) was started in Nabbale, Mukono District, in collaboration with the National Agricultural Research Organisation, Makerere University and Mukono Local Government. It brings together university graduates in the area from diverse backgrounds that will be trained on modern farming methods, processing, value addition to agricultural produce, and entrepreneurship. The project was launched by Mr Katooto Habib, a Member of Parliament, in an event that brought together different stakeholders including policymakers, researchers, civil society, and the private and public sectors. In his speech, MP Habib encouraged the youth to take advantage of the cutting edge technologies in agriculture and urged them to be patient and embrace the saving culture as well. Dr Maggie Kigozi, former Director of Uganda Investment Authority and a major shareholder in Pepsicola Uganda, urged the young people not to see themselves as powerless but instead use the different networks that they have already established to start something meaningful. The IITA Director General, Dr Sanginga Nteranya on his part advised the youth to be aggressive and very fast and to always consider gender equity in whatever they are doing.“IITA is going to support you in technology, knowledge, and advocacy but you should do the rest of the activities by yourselves,” he said. The Uganda National Agricultural Research organization (NARO) was also going to provide the youth with technologies that would help in furthering this new journey they had started, according to Dr. Ambrose Agona, NARO Director General. He noted there was a lot of energy in the youth that could be tapped and put to good use. Dr Piet van Asten, IITA–Uganda country representative, said the formation of the youth program was in response to the high priority during stakeholder engagement exercises that was placed on youth unemployment in Mukono and Wakiso, two districts where the IITA-led Humidtropics program is operating. Others at the event were Dr Victor Manyong, IITA Director for East Africa; Mr Buyungo Musa, the Coordinator for Parliamentary Forum on Food Security and Population Issues in the Parliament of Uganda, representatives of IYA from Nigeria, Kenya, and Tanzania, and representatives from other partnering institutions such as Makerere University, Uganda Christian University (UCU) as well as various farmers’ organizations. IYA from Uganda, Nigeria and Tanzania in a group photo with some of the dignitaries present at the launch.